Background: Faith institutions and Christian missionary activities have had great influence on Kenya. Interreligious and ecumenical relations illustrate the complexities and challenges of adapting to changing needs and transitioning to local leadership. 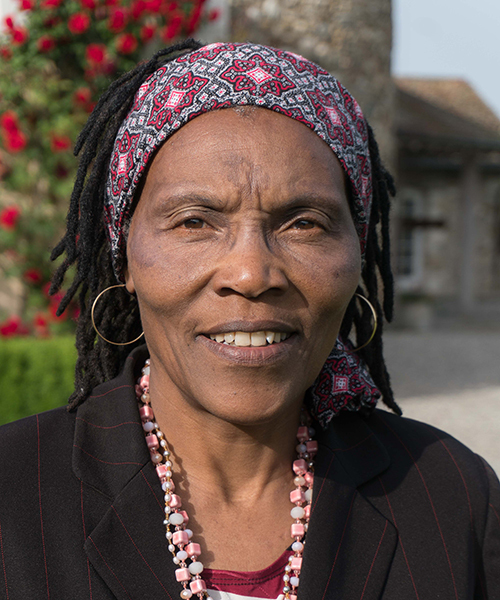 Esther Mombo, a professor and former deputy vice chancellor of academics at St. Paul’s University, met with Crystal Corman on campus in Limuru on April 16, 2015 to discuss how the Anglican church has adapted to and helped shape new narratives around both historical and contemporary issues. In this interview, Mombo explains how faith institutions adapted historically as the country opened up and multiple Christian denominations moved to the interior. In the contemporary context, she is leading the way in helping a faith-based university and training center respond to issues around gender equality, peaceful interreligious relations, and other societal challenges including HIV and AIDS. Her passion for gender equality has opened new space for female students and continues to transform the curriculum to impact both men and women as future church leaders. Can you tell me more about the history of St. Paul’s University? In 1873, St. Paul’s started as a divinity school in Freetown in Mombasa. It was a center for liberated slaves after the abolition of slave trade on the east coast of Africa. The center was founded by the then Church Missionary Society, which later became Church Mission Society (CMS). It was one of many faith-based centers on the coast; other centers dealing with freed slaves included Roman Catholics and Quakers. The abolition was led by the British government, discussing with the sultan of the coast. The divinity school started within this center in line with the aim of the CMS, which was to train liberated slaves and those who came to the center in different trades and evangelism so as to further establish the church in East Africa. The first leaders of the Anglican Church, for example—Ishmael Jones and David George—were liberated slaves. They were the first people to be ordained as clergy leading the church at the time. The school stayed in Mombasa until 1930 when it was moved Limuru, its current location, after the country opened up through the a railway line from Mombasa to Uganda. At the same time, Kenya had become a British colony. The school was also relocated to avoid the hot weather of the coast and the prevalence of malaria there. Many mission agencies were choosing to move to the highlands instead of settling in the coast. So, in 1930, the CMS decided that they could move the divinity school to the highlands. I’d like to know more about the ecumenical relations of those early missionaries. How did they interact with each other, and how can that be seen in Kenya today? With good communication and British rule, there were many mission societies in the highlands and increasing rivalry with each other. The societies established ways of dealing with the rivalry, including spheres of influence policy and holding conferences to discuss unity among them. The spheres of influence policy involved each different mission society taking responsibility for a designated part of the country, especially the region around the railway line. The boundaries, in some places, passed between families or clustered some ethnic groups together. Some societies became dominant in some areas. Away from the urban centers, today’s denominational landscape still bears the marks of this spheres of influence policy. Once the churches parsed the land, when did they start thinking about working together? The mainline churches began coming together to think about church unity as early as 1905. They came together in different regions to discuss the scandal of disunity and the rivalries that they had imported from Europe and America to Kenya. In a major conference held in 1913 called the Kikuyu Conference, Protestant mission agencies, including the CMS, Church of Scotland Mission, Methodist Mission, Quakers, Pentecostal, and African Inland Church, met to discuss the formation of a united church. In addition to dealing with theological issues of a united church, the conference dealt with issues of education, medical services, theological training, and industrial training. The different mission groups agreed on ways of realizing their deliberations, and they would report the information to their head offices [overseas], but the home offices objected to the issue of a united church. After 1913 World War I broke out. The discussions began again in major conferences held in 1918 and then again in 1926. In later years, several alliance institutions were established like alliance high schools and later the formation of the National Council of Churches. So the alliances worked in education. Did it work in theological education? Is that part of St. Paul’s story? The discussions about creating a united church did not materialize, but the creation of alliance institutions was realized. After World War II, discussions on creating a space to train ministers was revisited. The CMS (later Anglican Church of Kenya) had moved its divinity school from Mombasa to Limuru, its current location. As part of the unity discussions, the Methodists, Anglicans, and Presbyterians agreed to experiment by training their clergy together. In 1949, these three brought their ministerial students together to study English, history, and theology. However, when it comes to church polity, they studied separately so that each group would learn their own tradition. This experiment ran between 1949 and 1955. In 1955, the divinity school became St. Paul’s United Theological College. In 1973, the Reformed Church of East Africa joined the union and sent their students to train together with Anglicans. The institution, however, remained a training place solely for men, with some special courses for the wives of these men. Men were training for ordained ministry, and women were training as supporters in child minding, cooking, and hospital tending. In 1994, these four churches were joined by the National Council of Churches (NCCK). The first woman student at St. Paul’s was an Anglican from Uganda, a refugee during the days of Idi Amin in 1976. She was later joined by a Presbyterian woman in 1978. From 1980 onward, women began training here, but the numbers were always small. St. Paul’s began the process of transforming from a theological school to a university in 1985. This transformation came about due to the increased need of education in Kenya. The government, through its public universities, could not manage the number of students who were seeking an university education. The process of transforming to a university was very slow because of the diversities of the four churches and one national Christian council. Between 2003 and 2006, the processes of accreditation were completed, paving the way for another change. In September 2007, St. Paul’s United Theological College was chartered as a fully-fledged private university, with the official name becoming St. Paul’s University. In addition to having theological courses, other courses were started including business, communication, computer science, and development. So how did you come to join St. Paul’s? In 1999 I joined the university as a lecturer. I had recently completed my Ph.D. at Edinburgh University, so I came back to Kenya looking for a job. As well as being a lecturer, I was appointed as academic dean in 1999. As academic dean, I was responsible for all the academic programs and, as a member of senior management, I had to contribute to the growth of the institution. In 2003, St. Paul’s celebrated a century of faithful ministry, and I took an active role in organizing for the centenary. From the time I joined the institution in 1999, I was involved in envisioning an institution of the Millennium. The envisioning included handling the processes of dealing with curriculum development, admission of students, hiring qualified staff, and ensuring that there was infrastructure that supported the other processes. When I came in 1999 there were just over 100 students, all studying theology, and about 85 percent were men. Among my achievements was being engaged in the diversification of the programs to have the institution become a fully-fledged university, but also facilitating the increase of women students of theology. The numbers of female students in theology courses was fewer than men, but this proportion is not the same in the churches. There were more women in the pews than at the pulpit. I sought to find out why this was the case, and one of the reason was the strong link between the study of theology and ordination. Theological education was an investment, and churches invested in men. Some churches also were not open to ordination of women, so they had no reason to send them to study. In liaison with my colleagues, we requested the council to open theological study for all interested parties, not just those seeking ordination. This would allow more women access to theological education. The church would choose who to ordain after theological study. This opened up room for women to study. When the council gave us an okay to admit all students to study theology, some women found their way here. Still, the numbers of women students were few. Seeing this, I looked closer and realized that most women struggled to raise funds to study. I embarked on fundraising activities, both locally and internationally, which helped the women to join the college. The numbers increased from 10, when I started here in 1999, to over 100 when I served. Upon completion of the degree, most of the churches welcomed these women and gave them positions of leadership. These women can now be found as senior leaders and academics in theological education. It sounds like you were very influential in changing the culture of St. Paul’s towards the inclusion of women in theological study. How did you manage to do so? The narrative above shows one way of doing it. I had to note the problem and find ways of dealing with each issue. One of the things I committed myself to is changing the face of St. Paul's to be inclusive of men and women, both as students and in positions of leadership. For students it was to deal with clauses that barred them from study. For positions of leadership, I took time to encourage women to undertake studies that could help them take positions of leadership. It was not easy for me to be in senior management and a pioneer. I faced challenges from men who did not think that women could lead. I faced challenges from women who did not think women could lead. This was due to the stereotypical roles identified with women which were accepted as ideal. I had to prove to both groups that the position of leadership in the university was not a gendered position, but one that was based on skills and qualification. As a pioneer, I worked hard to show that my position was within the university structure, and it called for all people who are qualify to lead. I had to convince those within the college/university but also those outside the institution, namely church leadership, some of whom were immersed in clericalism—and I was not clergy. My position on inclusion of women and other marginalized groups was seen by some as a challenge to the church and university institution. This work was challenging, but I was keen to see the face of St. Paul's changed where there was space for men and women, lay and ordained, young and old. When the university was charged, I had to apply for a new post, the deputy vice chancellor of academic affairs (DVCAA). I applied and was offered the position. This gave me even more impetus, enthusiasm, and power to really move things! It is a three-year post, so I finished my first three years in December 2010. After the first three years of being DVCAA, the university had grown tremendously in infrastructure and human resource. My office was engaged with students and faculty as well as national and international partnerships. Within the classroom and curriculum development, what issues and topics have you focused on? When I joined St. Paul's, the challenge of HIV was high on the agenda, and it was among the topics I taught. I also taught units on women and theology and broader gender issues. The 1998 bombing at the U.S. embassy created heightened tensions and suspicion among people who had lived alongside each other with little open conflict. That event was an external conflict being fought on Kenyan soil. The local situation would not remain the same. This led us at St. Paul’s to think how best to prepare our students. In the past, and even today, some families in Kenya are multi-religious. As you look around the country, the distribution of Christians and Muslims differs, with some areas having majority-Christian and others majority-Muslim. In 2004 the university launched a master's course, adding on to the undergraduate course, on interfaith matters. The course addresses both religious literacy and conflict resolution skills for peaceful co-existence. Students pursing an M.A. degree in Islam and Christian and Muslim relations have come from Kenya, Nigeria, Senegal, Sudan, Sierra Leone, Madagascar, Togo, Tanzania, Turkey, and others. Faculty is drawn from among Christians and Muslims who are qualified to teach at university. The units taught include Qur'anic Arabic, Islamic theology, gender issues in Islam, Christian-Muslim relations, among others. The course is unique from other courses in interfaith matters because a major focus is on Islam and Christian-Muslim relations. There is a conscious effort to help in resolving conflict and fostering peaceful coexistence. Have you had Muslim students enroll at St. Paul’s for this master’s degree? Yes, we have had a few students enroll for this course. Before the 1998 bombings, what were issues or areas of contention between Christians and Muslims in Kenya? Before the 1998 bombings, Christians and Muslims struggled for their livelihood in areas of education, health, economics, and infrastructure. The issues emanated from the realities of poor development in some parts of the countries and especially areas with a Muslim-majority population. How have you brought gender into the curriculum? As early as 2003, we began engendering the curriculum of theology. With my leadership, we consciously looked at the curriculum and mainstreamed gender so that every student understands the role of gender relations as it plays out within the family, the church, and the wider society. How do you see the inclusion of gender in theological studies changing your students? There are students who do it [coursework on gender] for the sake of passing the exam, and their beliefs remain very strong. But there are those that really get convinced and converted, for lack of a better word. You see the way these graduates then structure their churches when they go on in life. You also see a change in the way they treat their own wives or other women. You hope that this will grow into the senior leadership and then affect the whole church structure. I can see the ripple effect of teaching; you are impacting the future leaders as it were. So they go with a different mentality. That’s been the joy of influencing and impacting students. I imagine moving change on gender in an institution was challenging. What was your experience? It was challenging, yes. But with the Millennium approaching, the climate was ripe to re-envision anew for theological education and also an inclusive church. It meant dealing with myths about women and church leadership, such as the fear about women in positions of leadership. It also involved redefining feminism, which had a negative connotation. In a male-dominated institution, most of whom were clerics, I, as a lay woman, had to lobby among colleagues to support the inclusion of women. In my work I was inspired and encouraged by the Circle of Concerned African Women Theologians. It became a very important source in terms of dealing with the triple patriarchal heritage of African women. Could you talk about the Circle of Concerned African Women Theologians? The Circle was founded in 1989 at Legon, Ghana under the leadership of Professor Mercy Amba Oduyoye. She is a theologian from Ghana who had worked internationally and ecumenically at the level of the World Council of Churches. She noticed the lack of African women doing theology and the dearth of information on theology from women’s perspectives. The aim of the Circle was to research and write theology about women and by women. Some of the areas of focus were the Bible, culture, violence against women, and interfaith relations. In line with the situation of the continent, the Circle was open to women of all religious traditions of Africa. To serve women better, the Circle met in different chapters but held its conferences once every six years. The Circle worked on different themes, but at the peak of the HIV/AIDS pandemic the Circle took a number of years to research and write about this topic. The Circle was among the first groups to really engage on issues of HIV, including violence, patriarchy, masculinity, stigma, discrimination, and sexual and gender-based violence. It’s interesting to see that HIV and AIDS provided an opportunity or a space for women. Has this opening of space and dialogue had larger impact? HIV became a mirror into many issues in our society including the depth of the Christian faith, the gender and economic disparities, and the resilience of women in difficult circumstances. It also helped to deepen the discussions on the role and place of women in leadership, both in church and society. The leadership roles of women in some churches are being widened. The Methodist church of Kenya, for example, now has two female bishops. In other churches women continue to hold significant leadership positions. What are some of the culture issues that you see in Kenya that affect people’s lives? In the name of culture, you can still find female genital mutilation, child marriages, commercialized bride wealth, and sexual and gender-based violence in some areas of Kenya. What can the church do to better address these issues? The church needs to allow more room for dialogue and to really hear the voices of women. The church must also learn how to best accompany the survivors of violence. Additionally, the church can revisit the teachings of family and the ideologies that accompany those teachings. Do you see scholars or theologians reinterpreting scripture to address this gender inequality? One of our female scholars, who is in the Circle, reads Paul (in the New Testament of the Bible) from a post-colonial woman’s perspective. Her approach is really mind-opening and challenges the issues of submission and obedience. There is also the method of contextual Bible study where the Bible is read in community rather than just preaching; people read and talk about the Bible, engage with it. Using this method, you are able to read the scriptures in a more egalitarian way. For example, we worked with Fellowship of Christian Councils and Churches in the Great Lakes and Horn of Africa to produce the Tamar Campaign against gender-based violence. It has begun to shift the way people read the scripture. It also allowed people to speak about violence more openly, which they never used to do. There are also those working on the notion of positive masculinities, with booklets and Bible studies on positive masculinities. Where do you think people of faith need to focus their attention now? There are three areas. First, people of all faiths can look at their texts and examine how their texts can be used to liberate those that are oppressed in their societies and communities. Texts are very important for people of faith. I would say they need to look at these texts in all ways, whether it is on gender, peace and conflict, education, economics, or politics. The second major issue is health and healing, whether you are looking at issues of a disease like HIV or of peace—because they are all to do with health and healing. A peaceful person is a healthy person. Thirdly, people need to focus on egalitarian existence, the relationship between men and women, and how men and women treat each other. If you are going to have an egalitarian society, you are going to start with the way we raise and train our youngsters.